The Sony A99 ISO Studio Test with Full Size Examples! First off, we’re giving one away! Click here to Enter our Sony a99 Giveaway! 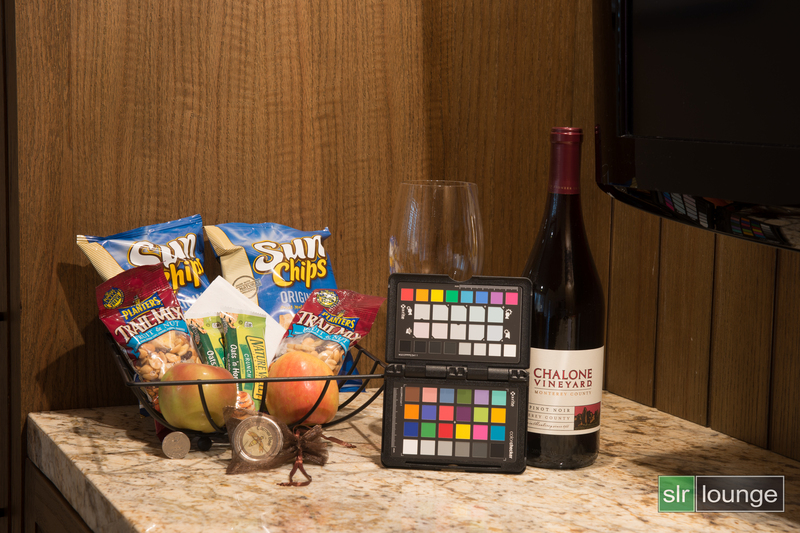 The feedback from my Extensive Field Review on the Sony A99 has been tremendous, to say the least, and so I thought I follow it up with a short post on the studio test that I did with my make-shift still life set from my hotel room in Carmel. I believe that on top of the images that I have in my review, this short test will reveal a quite a bit about the ISO performance of the Sony A99. The lighting that I used for this test was nothing more than a tungsten bulb. According to Lightroom 4, the Tungsten White Balance (WB) preset on the Sony A99 is set at 2700K color temperature with a +1 on Green-Red tint. 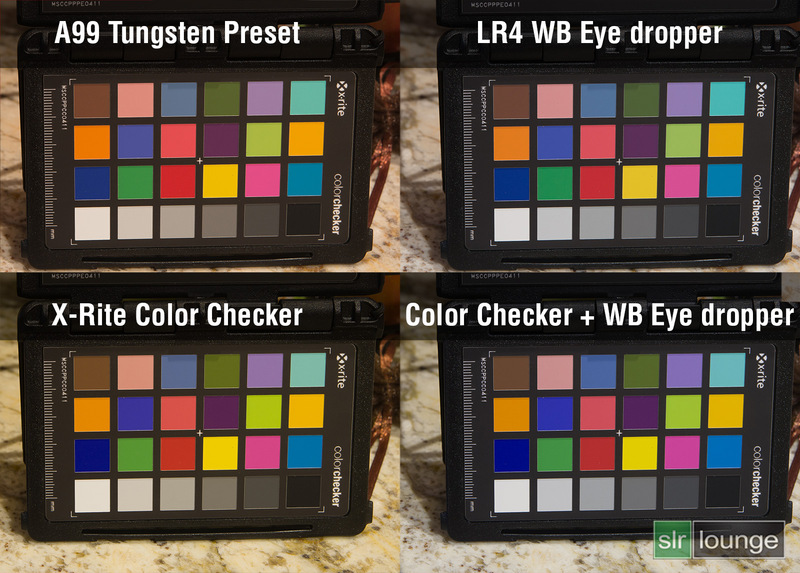 This is how the X-Rite Color Checker looks under the Tungsten WB preset. At first glance, it looks like that under this tungsten light, the A99’s Tungsten preset is a little warm, so I used Lightroom 4’s White Balance eyedropper on the neutral gray square under the yellow square on the bottom half of the Color Checker. The temperature went from 2700K to 2450K. The Green-Red tint stayed the same at +1. If you have read my review on the X-Rite Color Checker Passport, then you may recall that you can use the Color Checker to not only check the accuracy of the white balance, but to also see how each camera interprets individual colors. As you can see from the before and after image below, the A99 is fairly accurate. There is a noticeable shift in some of the blues (Column 1/Row 3, Column 2/Row 2, Column 6/Row 3), as well as the marble countertop behind the Color Checker. Now, if we compare the picture above after the WB has been corrected by the eye dropper, we get the image below. The temperature is 2450K for both, but the Color Checker version has a +5 on the Green-Red tint versus the original +1 tint. There is still a color shift in the deeper blue color, but the change in color for the marble top is less pronounced. It looks that based on this test, just by correcting for white balance in Lightroom 4 you can get very accurate colors on the Sony A99 that is fairly close to the calibrated colors from Color Checker Passport profile. Here is the comparison image with all four variations side-by-side. You can also click on the links below to see each variation in full-size resolution. Ok, so now that we know that the A99 is capable of capturing really accurate colors, let’s see what happen when we go through its ISO range from ISO50 to ISO25, 600. You can also click on each image to see the full-size resolution. The low ISOs are clean and very much in line with any professional-spec full-frame sensor in this price range. If you worry about any noise issue that may have been present because of the semi-translucent mirror, I think you can rest easy. Although signs of noise start to come in around ISO 1600, it is well controlled even up to ISO6400. The wood grain in the shadow of the basket has lost detail at 6400, though. As demonstrated with my low-light, high-ISO photos from my Sony A99 review, the A99 performs well in real life environment even up to ISO6400. Color looks accurate until around ISO8000, as well. ISO12, 800, when shrunk down for web-size images, is still pretty good. ISO25, 600, however, should be reserved for extreme low-light situations because at this point, color accuracy and noise control is pretty much out the door. Overall, except for the most habitual pixel peeper, most photographers should be satisfied enough with the performance of the A99 even in low light. In low ISOs, there is no question that the A99 is a high-end full-frame camera. Here are some 100% screen-grabs for some more direct comparisons. So folks, what do you think of the A99 performance in this ISO Studio Test? Don’t forget to check out my extensive field review of the A99! Would love to see this as well. Direct comparison of high ISO A99 vs 5DMIII is what I’m interested in overall. 5DMIII primary edge over all other cameras is supposed to be it’s insane high ISO noise suppression and is currently considered the camera to beat. I’d like to see how the A99 compares head-to-head! All the press unit samples are in New York for Photo Plus, but as soon as that event is done, I am going to see about requesting one to do a camera-to-camera shootout. Let me triple that request. Seriously considering the 5d3 vs the a99. Your efforts are appreciated. I would also make a test with custom WB if A99 has such feature. This usually gives much better result than the eyedropper tool. The tool will simply shift all colors so that the clicked color is neutral. Custom WB will measure the actual light and give proper colors according to the current lightning. Often you get not neutral but more natural looking image with custom WB. Are you talking about setting your own custom Kelvin or using a gray card reference? Yes, the A99 does have that feature, but since I’m shooting in Tungsten, I wanted to see how accurate that setting is. What I did forget to do is to shoot it in Auto WB to see if it’s the same, more accurate, or less accurate than the Tungsten WB preset.